A vertical urban farm will seed community farming in a graffiti-scarred L.A. neighborhood. George Irwin, CEO of Green Living Technologies in Rochester, N.Y.
(Fortune Small Business) -- George Irwin builds green structures for a living, but his latest project aspires to rebuild lives. This summer, Irwin is donating a vertical urban farm for residents of Los Angeles' graffiti-scarred Central City East. "Think of it as another way to make a community garden," says Irwin, 39, a landscaper by training. He's installing four massive garden walls - a total of 750 square feet - in and around the neighborhood, including one in a high school yard and another at a local housing project. 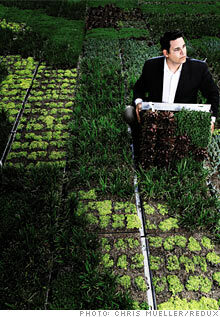 Each six-by 30-foot wall consists of 45 four-inch-deep, soil-bearing, irrigated vertical trays. Community farmers will be able to grow anything from strawberries to cherry tomatoes and melons. Irwin estimates that each wall will generate as much as 400 pounds of produce a season. He envisions entrepreneurs opening "wall-side stands" and local youth getting work skills installing and maintaining the vertical gardens of L.A.'s Skid Row. Gone 'shrooming: A foodie event grows out of one man's passion for mushrooms. To write a note to the editor about this article, click here. GuidelinesFortune Small Business will select a number of questions to answer each week. Submissions may appear online or in our print magazine. Please include a valid e-mail address and daytime telephone number. If your question is selected for publication, we will include and publish your full name, business name, title and location. If you have further questions about our 'Ask & Answer' process, please contact us at fsb_mail@timeinc.com.